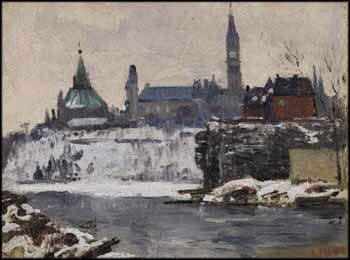 With its fine winter effects and historic architecture, this is a classic work by Canadian Impressionist Robert Pilot. Renowned for his urban scenes depicting the traditional architecture of Montreal and Quebec City, such as cathedrals and other landmark structures, here Pilot turned his attention to Ottawa's Parliament Buildings. Pilot was a master of atmospheric effects, such as twilight or the subtle winter light of day, as seen in this refined painting. The overcast illumination from the sky above is then bounced back by the snow, and there is a slight fog or ice crystal haze present in the air. This haze mutes and unifies the scene’s background elements, creating a soft ambience, while in contrast, Pilot has depicted the foreground as slightly more definite. Pilot's strength lay in his sensitive and romantic lyricism - rather than emphasizing the monumentality of the Parliament Buildings, he shows them in the context of their natural setting by the Ottawa River, and cloaked in winter's frosty airs. In 1957, Prime Minister John Diefenbaker presented a painting of the Ottawa Parliament Buildings by Pilot to Queen Elizabeth and Prince Philip to commemorate their visit to Canada.